“Castle by the Sea” is a beautiful and spacious Beach Vacation Home with 4 bedrooms, 3.5 bathrooms, and occupancy of up to 13 people. Located in desirable Roads End area of Lincoln City, Oregon. Situated on the second street from the ocean, offering views of the ocean from its many windows, deck and balcony. Beach access is a short walk away. Some of the outstanding amenities include: Hot Tub, Steam Sauna, Pool Table, WiFi, Big Screen TV’s, Gas Grill, Fire Pit, Deck, Balcony, Jetted Tub, Fireplaces, and much more. The home is loaded with many upgrades like travertine-tile floors, granite counter tops, vaulted and high ceilings, ceiling fans, exquisite woodwork. It features an open plan with spacious living area. Check out our website: www.castlebythesea.org. House Description: House features an open plan with a large Great Room, where you can relax on comfortable sofas near fireplace, watch the waves from its many windows, or enjoy a movie on big screen. Next to great room is the fully equipped gourmet kitchen with a large granite island bar that seats eight, and opens to dining room with a big, sturdy table that seats ten. Master Suite on main floor has King Bed, Full size futon, vaulted ceiling, fireplace, TV, ceiling fan, and balcony with ocean view. Adjoining Master Bath has a large tiled shower for two, jetted tub and dual vanity. Half bath is located on main floor. Lower level: Lower level has three bedrooms: 2nd Master Suite with King Bed, TV, wet bar and separate bath with steam sauna and shower. It also has a sliding door with access to patio, fire pit and hot tub up the stairs. There are two more bedrooms with two Queen Beds in each. All bedrooms have closets with built-ins. It is all set-up for you when you get there, and linens are provided. Another full bathroom with tub/shower is on the lower level. Outside: There is a large Deck with Hot Tub for seven, glass wind protecting walls, patio table, BBQ gas grill (connected to natural gas, so no worries of running out of gas). Patio out back has picnic table and fire pit. No parking restrictions. Keywords: Lincoln City, Roads End, beach house, ocean views, beach, Chinook Winds, Tanger Outlets, Lincoln Beach, family vacation, beach getaway, games, hot tub, Pacific Ocean, Oregon Coast. **FOR LARGE GROUPS (sleeps 29) (9+ bedrooms, 8+ bathrooms) RENT OUR 2 side-by-side homes "Castle by the Sea" OR brand new house "Serenity" located next to each other! Vit & Luda have lived in the Portland Metro Area for over 25 years. We have three beautiful daughters and two sons that love to vacation at “Castle by the Sea”. We love the beach, water and the Pacific Coast! Lincoln city is ideal destination since it is in a middle of area attractions such as Chinook Winds Golf Resort, Newport Aquarium, Tillamook Cheese Factory, Tanger Outlet Stores, Miles of Beautiful sandy Beaches and much more! Main Master Bath with Jetted Tub, Tiled Shower for Two, Dual Vanity. Lower Floor Master Bath with Dual Vanity and Steam Sauna with Shower. Third Bathroom on Lower Level with Tub/Shower combination. Half Bath on Main Floor. Granite Countertops and Tile Floors in all bathrooms. Beautiful Ocean Views from Great Room, Master Suite, Deck, Hot Tub & Balcony. Automatic dishwasher with an array of options. Double door refrigerator with ice maker and water dispenser. Fully Equipped Kitchen with all the gadgets, utensils, etc. Lots of counter space and huge granite island bar. Dining table in the adjoining dining area. Dining room is connected to the kitchen and more people can sit around the kitchen island. Big screen curved TV in the great room. TV's in both master bedrooms. Various DVD's to choose from. Located in the fully finished and heated garage. Game Room includes Pool Table, Shuffleboard and foosball. Chest with equipment for outdoor games, such as crocket, horseshoe, tennis, beach toys. X-box with a games collection. Various board games such as Monopoly, Life, Clue, Apples to Apples, etc. Located in the heated garage game room. Couch for onlookers. Puzzles, board games, beach toys. X-box with a games collection. Back yard area includes patio area, picnic table, fire-pit, room to play hide and seek with kids. Balcony off master suite with Ocean Views. Large 2nd story deck with ocean views, 7-seat Marquis Euphoria hot-tub, patio table & Gas BBQ Grill. Marquis Euphoria Hot Tub comfortably accommodates a crowd with seven generous seats, located on the deck. Playroom in the finished and insulated garage offers: Pool Table, Shuffle Board, Foosball Table and other games. There is a wall heater to use in colder months. Large Deck with ocean views, Marquis Spa for seven, glass wind protecting walls, patio table, Gas BBQ grill, stairs to ground level patio. Patio out back with picnic table, fire pit & outside games. Minimum Age Limit for Renters: This home is intended to be rented to adults over 25 years of age. This was a great home that accommodated our large family. It was close to the beach and was well stocked with fun games that everyone enjoyed. We will definitely return to this home! We really enjoyed the house. The owners were very helpful and answered information requests very promptly. This is an awesome home to book. We were 3 families with kids from very young to 18. The kitchen/family room was perfect. The island was the largest we have ever seen but they have about 8 stools you can sit around and eat and just be together. The table also could sit easily 10. We were 10 and could all be in the same space with more room than you need. The view was great, you could see the ocean, sit in the hot tub right off the main floor so even then you could still be connected to everyone. The house is very equipped to cook anything. Plenty of beds and bathrooms. A couple of beach access points, a short walk but super easy...great location (also super close to Safeway). Luda the owner was very responsive, easy to work with. The value was 100% on point. We love this vacation rental! Always have the best time. Our family has stayed here 3 times now for our early family Christmas gathering. We always have the greatest time! This house has all the amenities. The Kitchen is our favorite part and has plenty of cookware, dishes and utensils. We look forward to this vacation rental every year. A few hiccups when we arrived but the owners were amazing and took great care of us! The home was beautiful and had everything we needed for our Annual Girls Weekend! We can't wait to see the new rental they are working on! This house was great for our family! 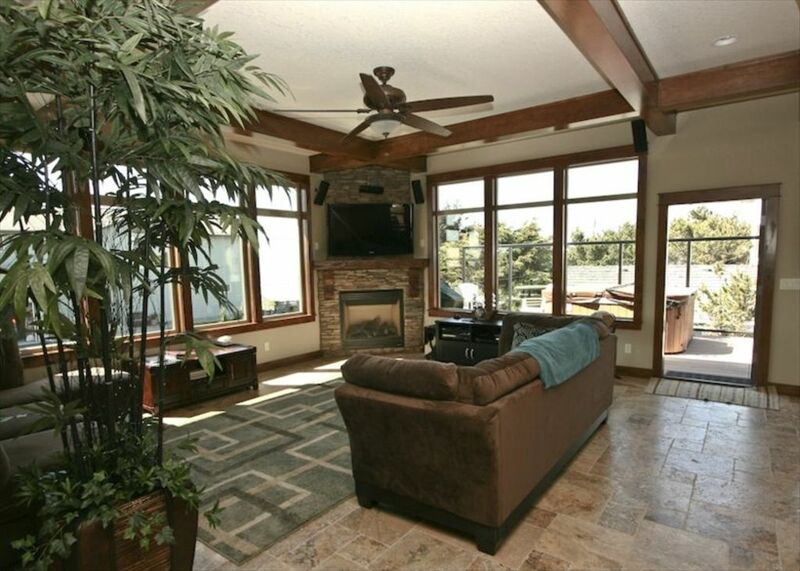 Very nice layout, spacious, the kitchen, dining and great room was perfect for a large group! Easy walk to the beach and we really enjoyed the game room. The only reason I’m not giving it five stars is that it could have been cleaner, but I would recommend this house and we would stay there again! Road’s End, the favorite, quiet community at the north end of Lincoln City. Close to everything you want, but far enough to leave the hustle and bustle behind. This area is host to miles of wonderful beaches, spectacular views and Chinook Winds Casino. Nearby Attractions: The 20 Miracle Miles from Lincoln City to Newport! Numerous shops, restaurants, fishing and sightseeing excursions, casino, miles of sandy beaches and rugged coastline to explore. There are two airports that provide easy access in and out of the area. The regional Siletz Bay Airport located just south of town serves private smaller crafts. If you're flying into the region, Portland International is your best bet, as they are served by most major airlines. You can rent a car in Portland and drive here or take the Chinook Winds casino shuttle, Caravan Transportation or rent a car! Lincoln City, OR 97367, few minutes away from our beach house! All cancellations accrue a minimum of $25.00 cancellation fee. Refer to our rental agreement for more details.